There's a very popular topic on Stack Overflow's Meta asking to Ban ImageShack Images. This was created because ImageShack deletes old images to free up server space, making images within older posts fail to load. Can we block ImageShack across the entire Stack Exchange network? 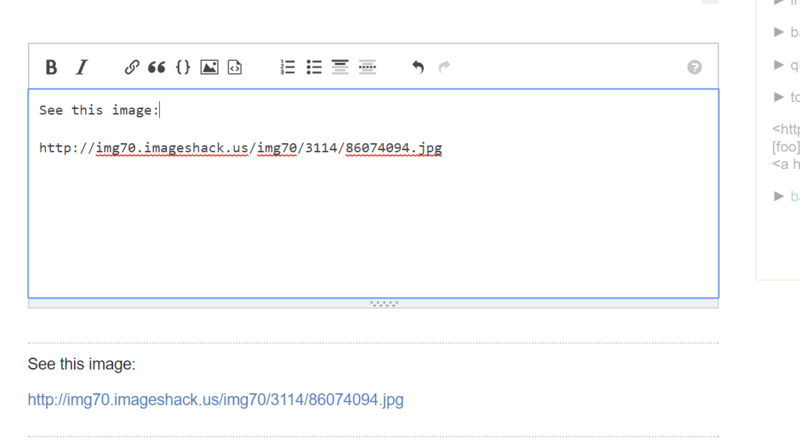 We have started showing a warning message when images are uploaded to Imageshack. We are planning on doing more such as sweeping through and uploading all images to our hosted image server over time. Old images in historical posts that no longer exist are very difficult to track down, so we may need your help finding them and re-uploading them as they are discovered. I completely support banning ImageShack images in new posts. The fact that it's an unreliable image host would be reason enough in itself, but the replacement of images by ads just adds insult to injury. Images hosted on ImageShack are not allowed in posts, because they may get deleted and replaced by advertisements. Please use the image upload button in the editor toolbar (or press Ctrl+G) to upload your images instead. Run this SEDE query to get a list of posts to fix. The query only returns posts that have images directly loaded from ImageShack, not those the merely link to ImageShack. To find those, enter url:imageshack.us in the search box. The links above give results for meta.SE; for other sites, use the "switch sites" box, or edit the URL directly. For Stack Overflow (which has way more than 1000 matching posts, and for which the query would time out without the arbitrary 1000 row cutoff), try this variant query that only shows posts with 10+ score. 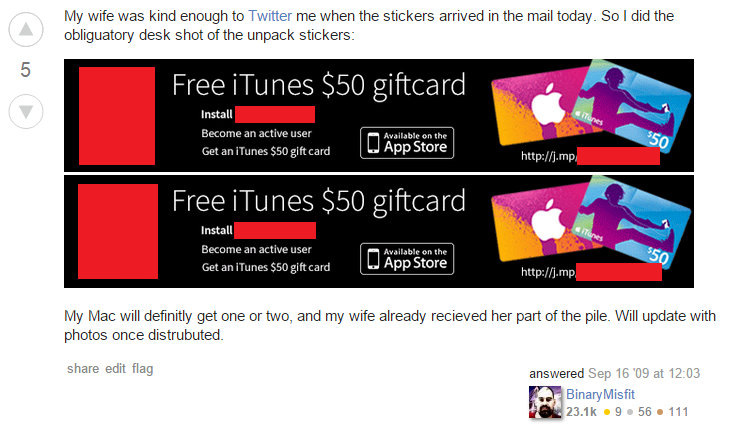 If the images still work, edit the post and reupload them to Stack Exchange's imgur account using the image upload button in the editor toolbar. If they're already broken, try to recover them from the Wayback Machine by prepending http://web.archive.org/web/2/ to the image URLs, and reupload the recovered images to stack.imgur. (Please don't just leave the image links pointing to archive.org; while this does generally work, we don't really want to rely on them or cause them extra server load.) To make this easier, you may wish to install this user script, which automatically tries to reload ImageShack images from archive.org when you click them, and also highlights such images by graying them out and adding a red dashed border. If you can't recover the images, and the author of the post is still around, consider leaving them a polite comment to let them know that their post is broken, and asking them to reupload the images if they can. If the author seems to be long gone, see if you can simply edit out the broken images without unduly damaging the post, or perhaps even try to recreate them yourself. Finally, if the post really seems unrecoverable and useless without the images, you may wish to flag it or, if you can, just vote to delete it yourself. For locked posts, see this meta.SE thread. "reupload images from imageshack to stack.imgur before they get replaced by ads; see http://meta.stackexchange.com/q/263771"
This is especially important if you don't have full edit privileges on the site, so that your edits have to go through review. While you're editing the post, see if there's anything else (spelling, grammar, Markdown syntax, needless "Hi!" / "Thanks in advance! ", etc.) that you can easily fix at the same time. Having edited the post, see if other posts in the same thread also have ImageShack images (the user script helps here too) and fix them as well. A lot of broken images are found in old long threads, and it's better to only bump the thread once. Don't make too many edits at once, to avoid flooding the front page. (What counts as too many depends on the site.) Also consider spreading your efforts across multiple sites. For reference, I posted the original version of these instructions on meta.MathOverflow. It was suggested there that they might be useful to folks dealing with this issue on other sites, too. Maybe Stack Exchange could gather up a list of all old ImageShack images urls, offer to pay the ransom for them, move them into imgur, and update the references server-side. I think it's OK to ban some image hosting services going forwards but we should be wary of blocking existing content. One thing that can be done is to automatically mask images from disallowed sites in the same way that spoilers are hidden but allow revealing them manually. Changing hotlinking/embed codes is strictly prohibited. Free ImageShack accounts are not allowed to link to direct links. Circumventing ImageShacks ability to enforces it's policies on free accounts and changing linking codes may result in deletion of your content and/or account. Maybe the images in question has violated this rule? Not the answer you're looking for? 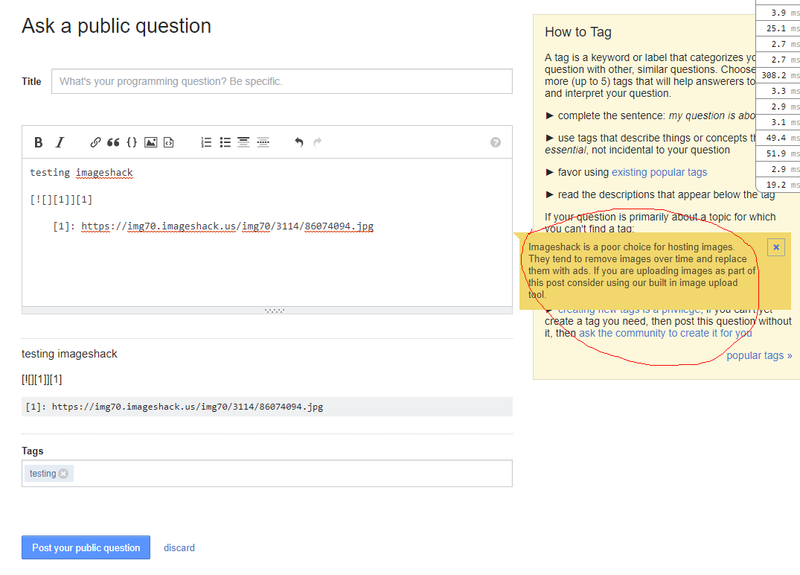 Browse other questions tagged feature-request status-planned spam images advertising . Images in meta T-shirt questions seem to have become spam? What's the official stance on the bounty ad? Can I search for questions with images? How many abandoned images are hosted for Stack Exchange? What to do with images that contains self-advertising?